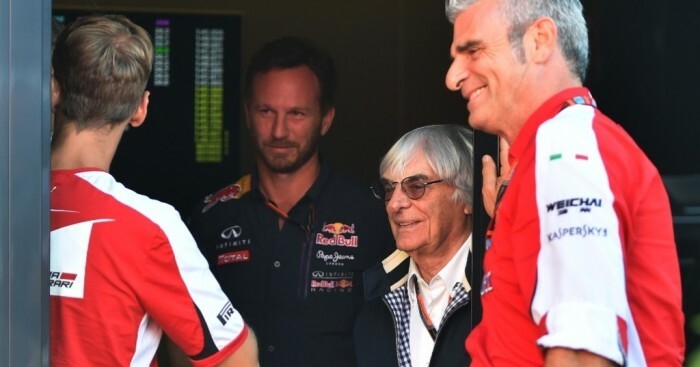 Red Bull and Toro Rosso are set to be powered by Ferrari in 2016 with the Italian manufacturer confirming they don't have a problem supplying engines to their rivals. Red Bull have been powered by Renault since the 2007 season and they won four consecutive Drivers' and Constructors' Championship from 2010 until 2013 while their sister squad STR switched in 2014. However, the relationship between the Milton Keynes squad and the French manufacturer has gone south since the switch to V6 engines at the start of 2014 as their power units are well short of that of that of pacesetters Mercedes. It was initially reported that Red Bull could switch to Merc engines next year, but the German manufacturer's parent company Daimler is not in favour of powering one of their main rivals. Ferari, though, have confirmed they are open to supplying Red Bull with engines and after several high-level meetings in Monza over the weekend team principal Maurizio Arrivabene told The Guardian: "Red Bull have big names, with Adrian Newey as chief designer, and it is easy to think if you give them the engine they will build a scary chassis, which means they will be really competitive. "My team, my engineers and aerodynamicists know their jobs. For that reason I don’t have a problem and competition is nice when you have a stronger competitor. "This doesn’t mean tomorrow morning we will give our engines to Red Bull but I don’t see any problem to give our engine to any other team or be scared of the competition before they start. This is not the right spirit of competition, of what Ferrari represents. We fight with everybody."